Bathroom sinks are available in a wide range of sizes and actual dimensions are never standard parameters but rather measurements determined by manufacturers depending on a type and style of a certain sink. Undermount rectangular sink might vary from 16 to 24 inches in width (side to side measurements) and from 12” to 18” in depth (front to back measurements). Actual interior bowl dimensions will be 1 1/2 – 2 1/2 inches smaller around the whole sink perimeter. Typical height from the top to lowest point of undermount vanity sink usually stays within 7 – 9 inches. It doesn’t mean the actual dimensions will be limited to these numbers and some sinks might be wider of deeper. But usually undermount bathroom sink do not exceed 30” in width and 22” in depth. 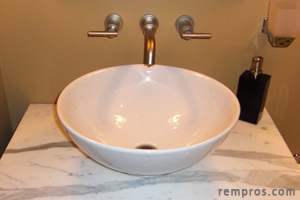 Rounded vessel sinks typically vary from 14 to 20 inches (36 – 51 centimeters) in diameter and 4” – 7” in height. Wall mounted or pedestal lavatory sinks with overall dimensions 24”W x 20”D x 6”H have smaller bowls and some additional space from sides for an accommodating hand soap dispenser or other smaller bathroom accessories. Vanity tops with integrated sinks come as one solid unit and very often are made accordingly to some standard cabinet dimensions with 0.5 inches overhung from both sides and 3/4” – 1” from the front. While shopping for a bathroom sink always consider different shapes availability. While oval, rectangular and ideal rounder are the most commonly used there are hundreds of other sophisticated and stylish sinks available. Ceramic and porcelain is the most popular materials bathroom sinks are made of. But 16 gauge copper, ½” thick glass, 18 – 20 gauge stainless steel or solid surface vanity top with a sink might be a worth to consider for a certain bathroom design. Typically size has very little to do with cost of a bathroom sink. Price determination cannot be based on dimensions and very often smaller, but a higher quality stylish sink might have much more value than a bigger standard on budget option. Weight will directly depend on the material bathroom sink made of and its overall size. 24 x 16 x 7 ½ wall hung ceramic sink will weigh about 90 pounds (41 kilograms). At the same time 18 gauge copper 16” round sink will weigh about 8 lbs. While overall dimensions will have significant variations, inside depth and distance between lowest point and bathroom faucet will be essential parameter in convenience of using particular lavatory. Most of bathroom sinks have a drain hole 1 ¾” in diameter for a standard 1 ¼” drain. Many vanities came from manufacturer as a whole unit with no possibility of choosing a sink separately. Size of such products will normally define as overall measurements of assembled unit with a separate inside dimensions of a basin. What is ideal size of a bathroom sink? Personal preferences will play a prior role while choosing a right size of a sink. But always consider a practical use side. Some shallow sinks in combination with short faucets might not be convenient for you in use. Also tiny sinks might cause water splashing all over the vanity top.